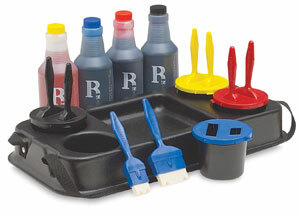 This system includes 4 pints of water-base, non-toxic Chromark ink in Red, Blue, Yellow, and Black in a sign caddy. The ink has very little odor. It will not bleed through even the thinnest butcher paper, and it dries almost as fast as permanent ink. Each container holds 1" and 2" wide felt brush Chromarkers. One side of the felt is notched to create multi-line effects. All parts are color-coded. ™ Chromark is a trademark.